By buying this product you can collect up to 1,045 Yachtaid Points. Your cart will total 1,045 points that will be converted into a voucher towards your next purchase! Must be logged in to collect points. The Marine Air Cruisair’s TWC Compact is a high-performance, cost effective tempering unit. The reverse cycle TWC cools and heats, and is available in an expanded product range of 24,000 (2-ton) to 72,000 (6-ton) BTU/hr capacities. The three new models include 48,000 (4-ton), 60,000 (5-ton), and 72,000 (6-ton) BTU/hr units. Units can be multiplexed for even larger capacities as required. 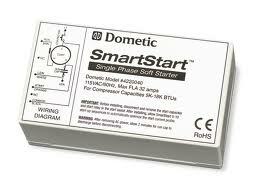 Each unit includes a chilled water (CW) flow switch, refrigerant high- and lowrefrigerant pressure switches, and inlet and outlet CW temperature sensors. The TWC does not include a chilled water modulating flow control, which means air handlers with or without flow controls can be used. * The brazed platecoil evaporator and coaxial cupronickel seawater condenser allow for superior cooling and heating performance. 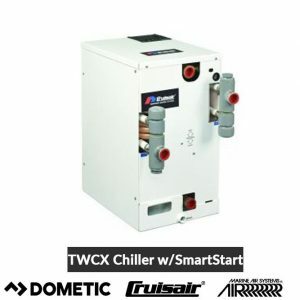 On 2- to 3-ton units, an electrical box mounted on top of the chiller houses the control board as well as starting components, and can be mounted remotely up to 6 ft. (1.8m) away. On 4- to 6-ton units, the electric box is normally contained within the enclosure and does not contribute to height. A remote electric box is available upon request for 4- to 6-ton units. Two control systems are available. The standard control is our proven Digital Diagnostic Control (DDC) that provides simple, single-stage operation. For multiplexed systems, the Tempered Water Logic Control (TWLC) with LCD screen is available. Depending on the configuration, additional cables, switches, sensors, or a display may be required. All TWC chillers come with R-410A, the preferred environmentally safe refrigerant used in modern, high-efficiency air conditioning systems.